All three and four year olds are eligible for 15 hours free early education - at a nursery or with some childminders - each week during term time (38 weeks), beginning the term after the child's third birthday. 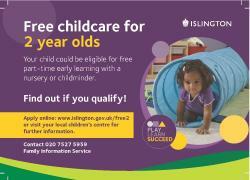 For further information about free childcare and early education see Islington's Free Early Education webpage, or contact the Family Information Service, 020 7527 5959. The Childcare Choices website outlines the full range of help for parents with childcare costs.